At 19, Tom Nardone started working for the post office as a mailman. He soon realized that his potential – and income – would always be limited as a mailman. So he took the opportunity to take some real estate investing courses, buying his first house in 1983, at age 23. It quickly became apparent that he had a real advantage as a mailman, because he saw so much on his route, looking at houses every day, seeing what was up for sale or foreclosure. There were opportunities everywhere. As a kid, Tom’s Dad, who was a cop, had moonlighted building houses. He would go on job sites with his Dad and watch how it was done, so he knew about building and repairing houses. Tom started buying houses that were on his mail routes, then began networking with other carriers for referrals on vacant houses. He had a source of leads via the mail carriers that no one else had and he took advantage of it. When someone goes into foreclosure, before the Lis Pendens and the Complaint are filed, the only people who know that the house is headed for foreclosure are: #1) The borrower who can’t make the payment, #2) The lender who didn’t get the payment, and #3) The mailman who has to deliver the certified letter sent from the mortgage company to the borrower. By age 35, Tom had built a portfolio of 25 “keeper” rental houses and retired from his job. He had become known as the “Millionaire Mailman”. But after quitting his job, he realized he didn’t have the “inside scoop” anymore, so he began building a mailman bird dog network. Now, after 25 years, Tom has bought over 250 properties and is truly living the American dream. As a real estate mentor, Tom also loves working with students in negotiations with sellers, and over the phone. Many new students simply don’t know what to say when talking with sellers. He teaches how to build rapport with sellers, and getting the seller to quickly like you on the first encounter with them over the phone. Tom has mentored over 600 students; from almost every state in the USA, having started as an outsource coach for other national real estate gurus. Tom is co-author of the book “Secrets of the Real Estate Millionaires” and has created and written manuals for several real estate information products. 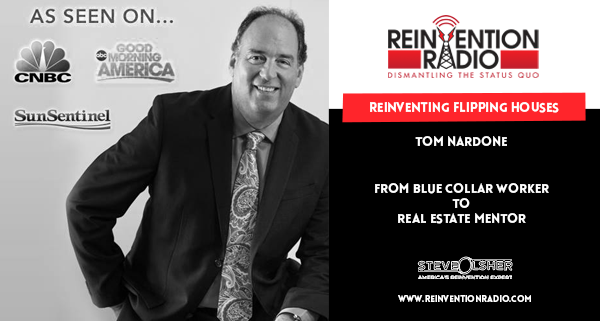 Tune in to hear Tom chat with Steve, Mary, and Richard about his career as a blue-collar mailman and how he used it to become the “Millionaire Mailman”. Reinventing DIY Websites – In this episode, tune in to hear Christina Hills discuss with Steve, Mary, and Richard how she empowers people to create websites that grow their businesses.